Option: Wine Blizzard Slushie: Make a Mojito slushie using dry white wine such as Chardonnay or Pinot Grigio. In a blender (56 oz.) use 1 package of the mix, 3/4 bottle of white wine, fill with ice. Blend and enjoy a terrific Mojito slushie drink. 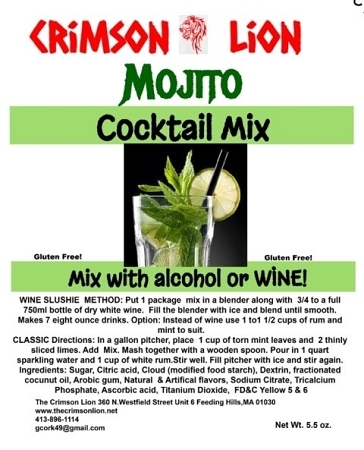 Optional: In a blender add 1 package of the mix, Use 1- 1/2 cups of Rum instead of wine and 1/2 cup of water, fill the blender with ice, blend and serve. A customer also advises they added fresh blackberries to the mix in the blender, and the taste was awesome. Try a Mojito Yogurt Cocktail recipe. Great for a brunch cocktail.. See recipe below.